With 539 expected to be delivered next Friday (30 May), this topic is to report sightings of the new Scania K320 being delivered and entered into service. 540 should arrive tomorrow (it left Adelaide today). 541 due on Thursday. It did. However, 542 might be delivered in place of 541. 542 appears to have departed - 544 is now parked at Scania (Adelaide). How will the announcement of Custom Coaches being placed into administration, affect the delivery of our buses? While in administration, the administrators (Deloites) are running it as a going concern, pending finding a buyer. I'd be guessing that deliveries will be unaffected. 539 and 540 are now at Belconnen workshops. 540 joined it by the evening of the 11th. Buses 542 & 543 were delivered to Woden Depot on the 10th & 11th respectfully. 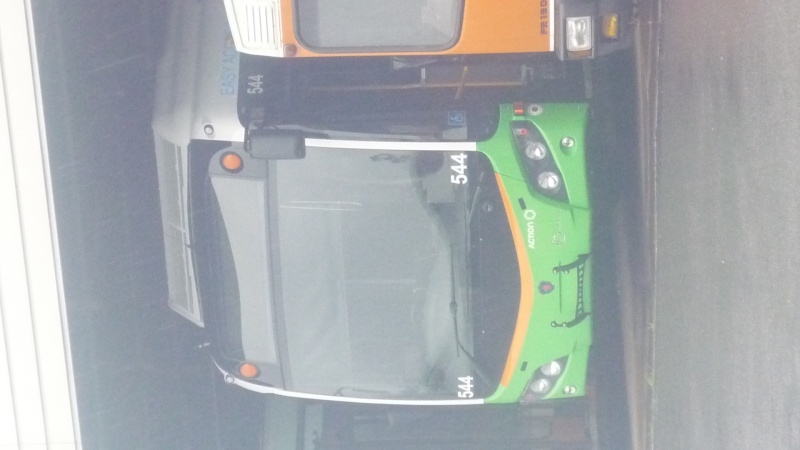 Buses 544 & (fairly certain) 545 arrived this week. Expect the buses to start entering service next week. EDIT-Bus 546 has arrived instead of 545 as previously reported. still 3 CB80s in Woden, 542, 544 and another one that can't be seen clearly, 818 has moved to where 709 was, next to the gate on Athllon Dr.
No straps there. It's a mounting bracket for the bike rack due to the different design of the CB80 and these being order with racks designed to go on then from the start. Will stop them having to drill huge holes in the body work to fit the racks. I spotted 541 doing on-road tests in the Belconnen Town Centre early this morning. 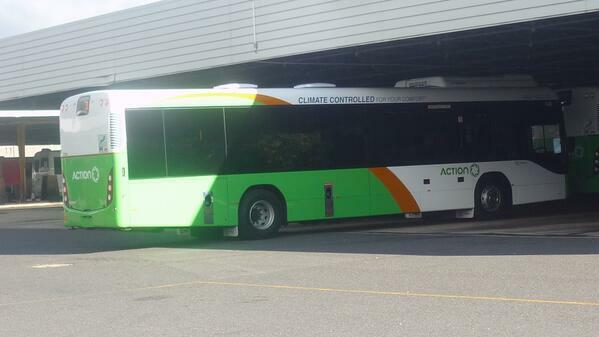 Bus 547 is now at Woden Depot, presumably it was delivered late yesterday. what happened to 545 to make it undeliverable? Bus 548 now at Woden Depot. Bus 549 recently arrived at Woden Depot. 549 was in service on Monday (I got it on a southbound 319). With the site being down, 539 to 544 (that I know of) are now in service for those who didn't know. 545 I haven't heard anything about nor seen. 546 to 548 are at B Depot Workshops too apparently. 550 to around 554 (being delivered today apparently) should be at Woden and on their way to Belconnen soon. 548 has entered service. 546 currently being used for training. 539 thru 544 and 548-549 are the in service buses so far. 547 has been used for training alongside 546. It was on driver training today. Neither 546 or 547 have entered service yet. For those who aren't following on twitter and/or fleetwiki: the first 10 vehicles (539-544, 546-549) are now in service with 546 on the road this week. The next two deliveries, 550 & 552, have been registered. Expect one or both in service next week. At a guess, they might be aiming for one new bus per week until about November. If I recall we are meant to be up to about 555 being here. I have a feeling Buses 545 & 551 have been lost when production lines were stopped in Adelaide. Now that (presumably) the buses are coming out of Sydney, unless Custom Coaches is closed for good. We shouldn't see anymore buses lost. Do we know whether they've cleaned out the Adelaide plant completely of our Scanias, and if so, what is the number of the first Sydney-originating Scania diesel standard bus for ACTION? You don't just lose a couple of buses with six figure price tags. Obviously those two had issues delaying their delivery. You don't hold up the rest of the orders just so you can keep going in numerical order. The delivery guy might of turned left out of Adelaide instead of right & hasn't found anywhere to turn around yet. Don't think it's happened yet. Reports suggest the Custom plant at Adelaide will close in early September, so there still could be a few more to come. Maybe up to 555? Would also depend on how many chassis Scania delivered (and when). Short-term? Do you mean if 545, 551 or other "missing" buses do not arrive when 559 is delivered? I doubt it. The side desto on 546 is interesting. Spotted it last week at Dickson departing on Route 8, and the side desto was not working at all. A few days later I saw it on a 956 - the desto was working, but the number 956 was flush against the right hand side of the display. In the few LED columns between the left side and the start of the number, I could just make out "City via Palmerston" scrolling through! So the front and side appear to have become a bit mixed up. The side desto on 546 is interesting. Spotted it last week at Dickson departing on Route 8, and the side desto was not working at all. I saw it yesterday morning. Nothing on the side desto but the front and back ones were fine. Slightly off topic: the Custom Bus plant at Adelaide closes today, with a new Custom Care facility opening next week at Wingfield (near the Scania yard). All new builds will come from Sydney. It's anyone's guess where 545 & 551 are right now. saw 552 driven by a mechanic today, believe it won't be in service this week. perhaps it would come out as the first bus for network '14? 551 & 555 were delivered this week (as reported by @traindriveriago). So they've nearly caught up with the contract - only 545 & 556 are "overdue", with 557 the only bus due in September. 552 was most likely in service yesterday, with 553 possibly ready for early next week. Actually I believe that she was out yesterday evening on some service along Box Hill Ave at Lanyon just after 1700 (18,19,318,319,718,719 but it wasn't a 775). 553 entered service last Tuesday. Apologies for not posting it here but it was on twitter. 554 was out early this morning with a mechanic behind the wheel. Does anyone know anything about what happened to the 545 yet? BUS.554 has been named (and has some signwriting - not exactly like 319 though) after the driver training asessor who recently passed away. One sign in the drivers cabin and one under the drivers window above the accreditation details or whatever that stuff is. Understand that there was a naming ceremony for that bus at the memorial service held for that gentleman at Tuggeranong Depot's remembrance garden last Saturday. Should have a definitive answer for this soon.